In the spring of 1969, Bristol Freighter CF-UME, operated by North Coast out of Prince Rupert B.C., was hauling fuel from Whitehorse, onto the frozen surface of Baker Lake, 37 miles to the northeast, in support of a mineral exploration program. After several days of successful shuttles, on what turned out to be her final voyage, arriving at Baker Lake, on roll-out after landing, CF-UME's starboard main wheel broke through the rotten ice. After a last-ditch rescue attempt came up short, 'UME' was left to its fate. An unsuccessful attempt was made in 1995 with sonar to locate it but the limited technology of the day didn't reveal any worthy targets. A dive was attempted but among other technical difficulties encountered, the lake bottom in the target area was 110' - 130' in depth ruling out anything but a very technical dive requiring more time and equipment. In August of 2018 we will launch another expedition and attempt to find CF-UME's final resting place. We meet over drinks to review the footage on a larger screen. More details are examined and reviewed. We have posted the images online, sparking a resurgence of interest in CF-UME. Already those who had even a passing involvement with this airplane have come forward with their own stories. It reminds us of an important notion; history need not be ancient to be studied and preserved. The Bristol Freighter is a fairly rare aircraft; of 214 built only 11 (now 12) remain in any kind of complete state. They were used heavily throughout the Commonwealth with most surviving examples concentrated in New Zealand and Canada. The last Bristol Freighter flew in 2004 and, had several museums and historical societies worldwide not jumped at the opportunity to collect and preserve these aircraft, it is not unthinkable that someday they may have existed only as faded black and white photos in an aircraft guide. We are proud to have given the world one more Bristol. Finding CF-UME was our goal, but our discoveries didn't end with a lost airplane. We were also able to take some interesting notes about the lake and its ecosystem. Previously it had been speculated that the lake may be anoxic during the long winter months. Some even claimed it was poisoned. But the scores of Slimy Sculpin as well as other aquatic invertebrate life we found have laid both theories to rest. Baker Lake is land locked, with no major waterways running in or out. It is only fed by surface runoff from the nearby mountains, preventing other significant species from moving in. We were prepared for the possibility of a Hydrogen sulphide haze at depth. Again, this was not the case, at least not in the part of the lake we surveyed. Hopefully there will be interest in this data as well. It's ninety minutes later and we're back on the lake. Our weather is holding and the lake is still calm. We take a bearing and the Trident is deployed. We hold our collective breath as the bottom comes into view. Still nothing. But we move ahead on the previously determined heading and a few moments later the Bristol appears in the twin beams of the LEDs. We're on the starboard side, right where we wanted to be. Immediately we're on the starboard engine nacelle. Two of the propeller blades are curled at the tip - reminding us that the engines were active when the landing gear broke through the ice. The nose section is next. We pilot the Trident as close to the bottom as we dare, remembering our earlier adventure with the marl. Our suspicions are confirmed as the cockpit has completely vanished beneath the foamy lakebed. Most likely it has been crushed by the weight of the fuselage, but it may be intact. The nose itself is far more damaged than we recorded on yesterday's dive. Both clamshell front doors have been shoved inward so violently that the outer plating has ruptured in some places, spewing forth shards of twisted spars. The underside of one of the doors has been ripped open, leaving a square opening large enough to pilot the ROV inside, if we were brave enough. After our experience with the anchor rope we settle for a quick peek. In the dim light we can make out the interior spar work as well as what looks like a cabin heater assembly and one of the long braces we are able to identify from historical photographs. Directly opposite the opening,the underside nose hatch is still intact and latched in place. The printing on it is still perfectly clear: "To Open Push White Button & Turn Handle". Another bit of writing on the landing gear leg really catches our attention. This one is hand-printed and reads "Tyre Press 85lbs/"". There is a matching note on the port side gear. Obviously a cheat sheet for a ground crew member during CF-UME's time in the UK. I wonder who scribbled it down, and would they have expected their tiny note to still exist after nearly half a century in an arctic lake? We move out along the massive wing. The port wing tip was buried in the lakebed, but the starboard is fully visible and still retains a vivid orange paint that seems to absorb and intensify the first light to touch it in decades. The landing light at the tip is cracked from its impact with the ice. Just before the Bristol disappeared into the lake, some enterprising workers from the area allegedly tied a rope and a barrel to the tail wheel in hopes of leaving a marker to the wreck. Unfortunately the rope was too short and the barrel never made it to the surface. Arriving at the tail wheel we are amused to find the rope still tied in place. Although the rope is now hanging down and we never do find the barrel, we are amused to verify this part of the story. The vertical stabilizer is still in place. The top half of it has, as we suspected, settled into the marl, but the rest is visible as is the aircraft's registration. We have one more section of the airplane to examine - the port side door. This means moving back around the nose and carefully venturing to the opposite side of the fuselage, keeping in mind the tangle hazards from the propellers and landing gear. Trident does this with ease. The door hinges appear to be complete and in place, so it is quite possible the door was purposely removed in order to unload CF-UME's final cargo. As with the nose section, we only venture in as far as the threshold, but the Trident's lights are able to illuminate the wall and ceiling section of the cargo hold very clearly. The dorsal hatch is still in place, but the inside walls of the fuselage show the same buckling and twisting as outside. Satisfied with our discoveries (at least for now), we move well away from the wreckage before returning to the surface. Back at the cabin we celebrate and gather around the controller's screen to review the footage and speculate on some of the details. Tomorrow we will break camp, pack up, and fly back to Whitehorse, and go our separate ways. Hopefully we will collaborate again in the near future. It's hard to believe that all these years of dreaming and searching have come to an end in just two days. Had this airplane been elsewhere, farther south or more easily accessible by water or road, it probably would have been discovered years ago. But a remote place like the Yukon still has its mysteries, and as long as it does, we'll keep searching. By early afternoon the weather shows signs of cooperating. The whitecaps have abated and the decision is made to go. Kyle and Sarah follow behind in an outrigger canoe. It's their first chance to see the ROV in action. We move into a new position, farther to the southeast of the buoy, in order to approach the Bristol from the starboard side without having to cross over the wreckage itself. The Trident is sent over the side and is quickly at the bottom. This is where the first of our issues occur. A marl (or marl-stone) lake is a stunning sight to behold. From above, the surface the water is usually a vivid emerald green with a light foam that deposits on the shoreline. The lake bottom, however, presents a new set of challenges when using a propeller-driven craft. Unlike clay which, when settled, generally requires physical contact in order to throw up significant debris, marl is almost ethereal, and any rush of water pressure will instantly cause a thick, swirling fog. We had no trouble with the marl on the previous dive as the Trident found the wreck almost immediately. But today we aren't so lucky. The airplane seems to be playing hide-and-seek. We set up a grid search using the Trident's built-in compass and dead reckoning, not an easy task when the nondescript bottom makes it much harder to judge distance travelled. Within a few passes it becomes clear that, although we were careful to stay just within sight of the bottom, the ROV's thrusters have stirred up enough marl to make spotting the wreck nearly impossible. At this rate we would have to literally run into the side of the fuselage to see it, even with the LEDs on. We begin to bring the Trident back to the surface. And that is when we realize the Trident is not moving. The video screen is live, we haven't lost power or control. But the ROV refuses to travel ahead, even at full power. Instead it pitches upwards whenever forward thrust is applied. We're tangled on something. As I mentioned in the previous post, there are several possibilities when discussing entanglement. A buoy line, an anchor line, and the wreckage itself are known hazards. The last of these is our greatest fear. We make a gentle about-face and begin to follow the tether back. The line itself is a bright yellow and extremely easy to spot. To our great relief it doesn't appear to be descending. That rules out being stuck on the bottom. As the water shifts from black to green the culprit appears. Another yellow line, this one marked every few feet with black tape. We recognize it instantly as the anchor. At some point during our grid pattern the ROV's tether has wrapped itself twice around the rope. We retrieve the anchor and manage to separate the two lines. Taking a moment to collect ourselves (and a few deep breaths), we decide to make one more attempt to find the wreck. By now we are running low on battery; towing 150' of tether through the grid pattern and fighting with the anchor line has used up most of it. We stow the Trident and head for the cabin for a recharge. As we watch the Trident's green charging lights blink on - one, then two, then three - nature seems to be taunting us. The wind has vanished and the lake is a picture of glassy perfection. And we're on shore. At this latitude we have plenty of daylight in August. But the same cannot be said for the stillness. It's dawn and things have changed. The wind has shifted to the north, bringing with it more forest fire smoke. The lake is dotted with whitecaps. Not the best conditions to be launching an ROV in. When deploying an ROV, or any tethered research device, a survey of potential hazards is crucial. In our case we have at least 150 feet (45m) of Trident tether out at any given time. In addition to this we have a 200 ft anchor line on the inflatable and a 130 ft buoy line in the immediate area. Add to that the propellers, landing gear, and fuselage of the Bristol Freighter, and top it off with the changing wind conditions, and the possibility of entanglement rises exponentially. Within minutes the team agrees that our survey of the Bristol Freighter's starboard side will have to wait at least a few hours longer. No time is wasted. We take this opportunity to further study historical photos of the aircraft and compare them to the footage we captured yesterday afternoon. There are some interesting discoveries; the vertical tail fin seems to have vanished beneath the aircraft and is no longer visible from the port side of the aircraft. Has it broken off, or is it driven several feet into the marl lake bed? The nose section appears to have been flattened, but where is the cockpit? Is it visible at all? And what happened to the port door? After marking the wreck with a buoy we return to the cabin and begin prepping for the next phase of the search. Now it's the OpenROV Trident's turn. We grab a quick snack and head back to the site. The sonar measured the approximate depth at 41m - well within the Trident's depth range. The tether strap is affixed to the ROV's tail end. There are sure to be several tangle hazards present so we decide to position the inflatable well to one side of the wreck. If necessary we will reposition the boat later for the other side. The anchor is dropped, and a few minutes later the Trident is lowered into the water. It dives in a 90 degree angle and is at the bottom within 60 seconds. The bottom of the lake is hauntingly alien with no visible landmarks, just a nondescript foamy texture that becomes stirred up whenever the thrusters are used within a few feet of the bottom. In lieu of landmarks the Trident moves ahead at a vector of 70 degrees magnetic. Moments later the ghostly outline of the Bristol Freighter appears on the controller screen. It's little more than a shadow at first, but as the ROV moves in the image becomes clear. We are on the aircraft's port side, which is now to the right as the aircraft is resting on its back, confirming our sonar findings. The northern water seems to have done a remarkable job of preserving the wreck. The black, white, and orange paint is largely untouched, save for the dusting of organic matter on the flat surfaces, and, although the magnesium parts have started to melt away, the rust appears minimal. 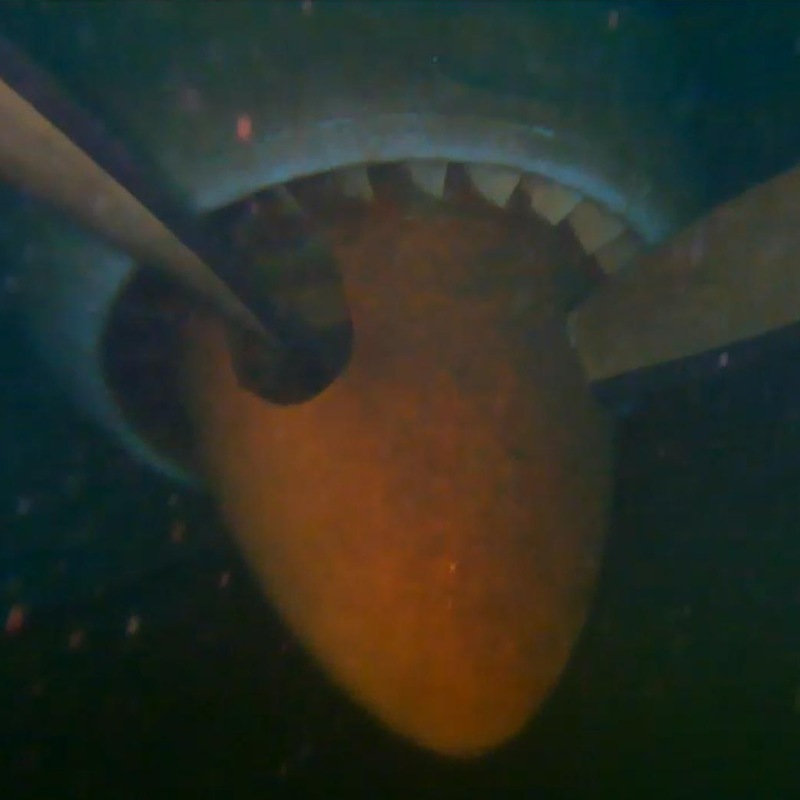 The Trident moves gently along the port engine, over the wing, and to the tail. The aircraft's port side door is missing; whether it was removed intentionally or torn off during its trip to the bottom is unknown. The aircraft's nose has been crumpled flat, most likely due to impact on the lake bottom. Long creases run the length of the fuselage, either from flexing or, as we suspect, from tearing through the surface ice on its final descent. The registration on the wing becomes visible. It's c/n 13074, aka CF-UME - the lost Bristol Freighter. By mid-afternoon the wind starts to pick up and we make the decision to return to the surface. We will return to the site tomorrow morning and attempt to capture images of the aircraft's starboard side. We pilot the inflatable onto the lake against a light to moderate wind. There is a faint hint of smoke from the forest fires burning in the area, but so far they are too distant to be of much concern to the team. The wind is of a greater concern as too much wave action could prevent the sonar from gaining a high-resolution image of the bottom. Baker Lake is approximately 6 km long (north-south) and 1 km across in most areas, which makes it a large area for a small boat to cover, even with multiple days on site. We also know that it's deep; estimates put it at 150', and although the water is crystal clear, the mountains on either side prevent sunlight from reaching the deepest areas. We do have an ace up our sleeve. A local historian who was involved in the earlier search was gracious enough to supply photographic records of the Bristol on the ice in 1969, as well as comparative panoramic photos of the area from 1995. By lining up the landmarks we are able to determine a fairly accurate location from which to begin our grid pattern. A buoy is placed, and the search begins. We are only two or three passes in when an unusual shape appears on the Hummingbird's screen. It looks almost airplane-like but only as an abstract example, more like two or three logs placed in a particular pattern. Not wanting to read too much into it, we mark the spot and continue. A few minutes later Kyle taxis out to us and stops to chat. He will fly back to Whitehorse for the last of our gear and his two dogs. His wife Sara is scheduled to fly in for a visit with a second float plane the next day. We casually mention and downplay our sonar find. Kyle taxis down the lake and takes off and we use the gps to resume our previous track. The hum of the Cessna has barely died off when we have a second hit on the sonar. This time it's no glitch, no pile of logs. "Tell me that isn't an airplane" Doug laughs as we come around for another run on the target. We make several more passes and the images gain resolution. The aircraft appears to be on its back at the base of a long underwater slope. We mark the target and are surprised to discover that the earlier ghostly shape was, in fact, the Bristol Freighter. After 49 years, CF-UME has been found. We had prepared ourselves for days of searching. It took 45 minutes. Less than 30 minutes later, after a few flyovers to discuss the landmarks previously seen in maps and satellite photos, we are touching down at scenic Baker Lake. We begin moving into the small trapper's cabin, graciously donated to the expedition by the owner; our home for the next few days. The inflatable boat is unpacked and is soon loaded with sonar gear, ropes, buoys, and weights. Doug, the senior member of the team, who previously discovered the Gold Rush-era steamer AJ Goddard, will help set out the search grid using marker buoys and the Hummingbird's built-in GPS. 'A search like this could take years' we remind ourselves to temper our expectations. Hopes are high, however, that this will be the year. The day is finally here; for the first time in over twenty years a team will attempt to find the lost Bristol Freighter of Baker Lake. It's a surreal experience as we load our gear onto Kyle's Cessna 180. It's a clear, cool morning with a high ceiling, perfect for flying. Finding Bristol Freighter CF-UME has been a goal of the expedition members for, in some cases, decades. Finally, in 2017, Doug Davidge, Steven Hanulik, and Kyle and Sara Cameron made a handshake deal to attempt to find the sunken airplane in the summer of 2018. We hope to find a target using conventional Hummingbird sonar, and then capture images using the newly-released OpenROV Trident. Baker Lake, Yukon (not to be confused with Baker Lake, Nunavut) is 37 miles northeast of the capital city of Whitehorse, and is typically only accessible by air in the summer. Fortunately we have been offered the use of a local trapper's cabin which will significantly reduce the amount of equipment we have to fly in, and Kyle and Sara, local pilots, will provide their float-equipped Cessna for transportation. We have a short window in the first week in August; we are hoping the northern weather will cooperate long enough for a successful search.